Doesn't look terribly orange no? Red wines in Georgia–whether aged in kvevri, barrel, tank, or what have you–are indeed some take on the color we all know as “red” and while coming in a variety of shades, no one would look at one and say, “I think that we should call this, ‘green’ wine.” But the wines made from white wine grapes and then aged in kvevri don’t often turn out “white” as how we think when looking at say, a Burgundy Chardonnay or Italian Pinot Grigio. They are definitely ad undeniably a darker hue. 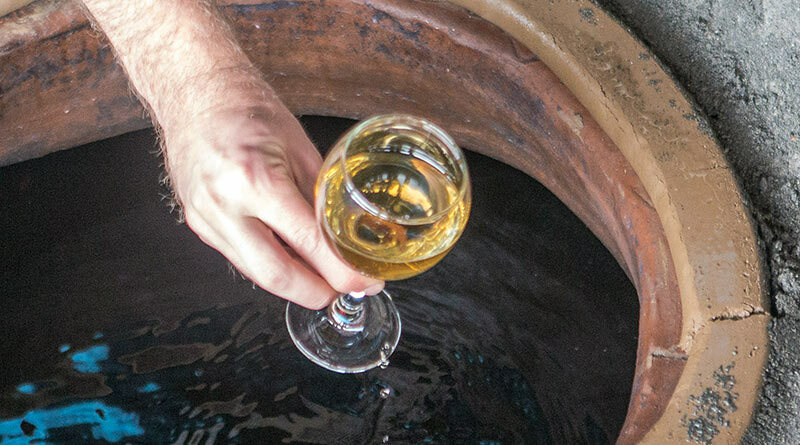 Due to the much longer contact with the skins, white wines will typically be of an “amber” shade in color which has become the generally-preferred tint when talking about these kinds of wines. This hasn’t always been the case and many people still use the descriptor “orange”, which is a term that was coined in the early aughts by a UK wine importer. It’s important to note that this importer was using it to describe wines from Italy. I say this because the Georgian kvevri white wines never, ever go fully “orange”. So, using this color are a descriptor is incredibly confusing as we’re talking about wines most people aren’t familiar with and so they can easily get the impression that the wines are in some way derived from oranges–in addition to thinking that “Georgian wine” refers to the US state and not the country. Keep in mind that “orange wine” can be one made of orange fruit juice, infused with orange peel (as is done in the south of Spain), from the Orange region in Australia, or then one of these wines wherein you have a base white wine with prolonged skin contact. No one in Georgia, if they do put a color adjective on the label, will write “orange” anymore and will put “amber” instead because it avoids a surplus bucket of sloppy and unneeded confusion. The amount of cutesy articles that start out, “So like, orange wine, is it’s made from oranges? No silly, it’s like totally a wine from grapes!” have already been innumerable. Thus as much as we call wines that are “golden” or “lemon” or “straw” in color, “white” wines, the more apt and sensible name for these wines should be “amber” going forward. Of course, if you want a more general term, much as we use “rosé” for any red wine with nominal skin contact, then referring to a white made via this process as a “skin-contact” wine will serve you well. Otherwise, if color inclined, amber, not orange is very much your friend.